Most of us have taken a taxi that increased the fare by taking the long route. The column compares matched pairs of taxi and Uber journeys in New York City to investigate how often drivers took unnecessary detours. Uber drivers were less likely to do this, suggesting that Uber's innovations in fare structure and digital feedback have reduced moral hazard. Digital platforms are growing rapidly, and so are their economic effects (Goldfarb and Tucker 2017, McAfee and Brynjolfsson 2017). Examples include large platforms such as Uber for ride-hailing and Airbnb for accommodation, as well as a growing number of smaller platforms such as ClassPass for fitness studios and Rover for dog-walking. Digital platforms are often designed to mitigate information asymmetry through the use of new technologies and incentive systems (Tabarrok and Cowen 2015) such as ratings of buyers and sellers, real-time monitoring, and low-cost complaint channels. For example, 73.5% of New York City (NYC) UberX trips are rated by passengers and Uber fare adjustments are made for one in every 170 trips. In contrast, lodging a complaint about a NYC taxi is much more difficult and occurs only one in every 6,356 trips. Do digital platforms significantly affect moral hazard or service quality, compared to traditional settings? The answer to this question is important if we want to understand the nature of online-offline competition and welfare in the digital economy. We study this question by comparing a particularly successful and pervasive digital platform – Uber – with traditional taxis (see also work by Cramer and Krueger 2016, Hall et al. 2015, Lam and Liu 2017). Specifically, we investigate driver detours, defined as the extra distance a driver adds to the fastest route between two points. In our context, this is a measure of driver moral hazard. In a hypothetical situation where a taxi driver and an Uber driver would drive between the same two points at the same time, the difference in the route they decide to take should reflect the benefits and costs to them of taking a detour. If features such as ratings, shared GPS navigation, tech-aided monitoring and digital feedback increase market transparency, and therefore increase the penalty of driver moral hazard, Uber drivers would be less likely to take inefficient routes than comparable taxi drivers. Identifying the effects of driver moral hazard is challenging, because we cannot observe the optimal route for a given trip directly. For example, using a 'long-run' average trip distance obtained from routing engines such as Google Maps may, in some cases, underestimate the true real-time optimal route. If there was a temporary road closure or unusual traffic that required a longer route than the long-run average, this would look like a detour. Therefore, we need to construct valid counterfactuals to infer opportunistic behaviour by using detailed trip-level data for both taxis and Uber. We overcome this challenge by using public taxi trip records and proprietary UberX data in NYC to match taxi and Uber trips at the origin-destination-time level. We match an Uber trip and a taxi trip if they both go from A to B, and begin at the same time (within the same 15-minute window).1 Therefore the matched trips have the same optimal routes, even if these optimal routes are not directly observed by researchers. Using taxi and Uber data from January to June 2016, the matching process generates a sample of 95,357 pairs of matched trips, involving 23,974 Uber drivers. Figure 1 plots the densities of within-match taxi-Uber distance ratios and duration ratios across route types. The left panel shows that taxi trips (solid red line) are significantly longer in distance than matched Uber trips for trips to LaGuardia and Newark airports, for which both taxi and Uber fares are metered in distance. Interestingly, however, taxi and Uber trips are similar in trip distance for JFK airport, for which taxis are paid a flat fare regardless of distance, and the Uber fare is metered in distance, as illustrated by the high peak around 1 (blue dashed line). Similarly, trips are similar in distance on non-airport trips (green dashed line), which are predominantly within Manhattan where density of pickups is high and detouring does not increase earnings. The right panel shows that taxis overall drive faster than Uber. Are route types randomly assigned? To formally test moral hazard, we take the matched pair as the unit of analysis, and regress taxi-Uber distance ratios on a set of route types that represent different moral hazard incentives for taxi and Uber drivers. We do this only for the sample that consists of non-airport trips and metered airport trips (that is, we exclude the special case of JFK trips). Non-airport trips are considered a 'no detour' benchmark because both taxi and Uber drivers lack incentives to detour on these routes – there are low returns (short distance) and high opportunity cost (foregone earnings from lost subsequent trips since a detour prolongs the trip).2 As a result, the coefficient estimate of 'airport' (treatment) measures how much more distance the taxi driver covers than the matched Uber driver in metered airport trips, when compared to the taxi-Uber distance difference in 'non-airport' trips (control). Therefore, this is a difference-in-differences approach. For taxis: There is no passenger selection of taxi drivers, as taxi drivers are ex antehomogeneous to passengers. Likewise, due to the strict taxi refusal law and sample over-representation of short trips in Manhattan and airport trips, driver selection of passengers is at best limited. For Uber: Rider assignment, performed by Uber's algorithm, is practically random to individual drivers, and driver selection of passengers is deterred through many mechanisms. Therefore, the market approximates the experimental ideal of random assignment. Nonetheless, we also exploit the within-driver variations in some specifications to further purge potential selection issues. We find that drivers respond opportunistically to changes in technology and incentives. When the fare is metered in trip distance, taxi drivers detour by an average distance of 7.4% on airport trips relative to Uber drivers. We also find that taxi drivers detour even more on these trips when the rider is from outside the New York City area. Uber drivers are not completely immune to moral hazard either. They are more likely to detour on metered airport trips during periods of high surge multipliers, during which time they are paid more per mile. An analysis of alternative routes reveals that drivers do not detour to make the trip quicker. Detouring on average leads to longer trip durations. Specifically, we perform a case study of routes between Midtown Manhattan and LaGuardia airport, and find that taxi drivers are more likely to take the further bridge than optimal when detouring, compared to Uber drivers. When they take the bridge further away, they are more likely to travel longer, compared to their fellow taxi drivers driving between the same two points who took the optimal bridge or tunnel. These time-wasting detours are more likely to be taken by taxi drivers with more experience on the specific route, suggesting that experienced drivers knowingly take the inefficient route. This is strong evidence for moral hazard. This is a large efficiency loss. Taxi driver detours result in 150 lost passenger hours per day in NYC, plus additional costs to the taxi driver in terms of time, gasoline and mileage on the car. The lost passenger time from Uber detours is 10 times smaller. 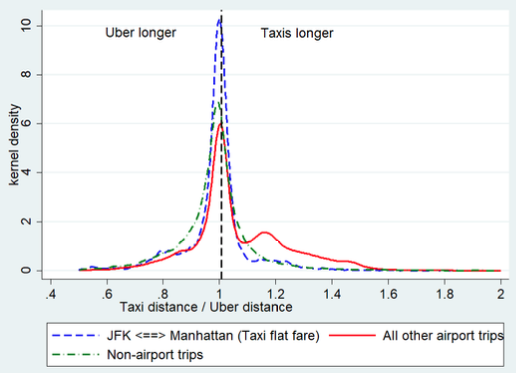 Given that both taxi and Uber metered fares reward detours on airport trips, reduced unnecessary travel by Uber drivers in these situations suggests an important role for tech-aided market design as a way to reduce moral hazard. 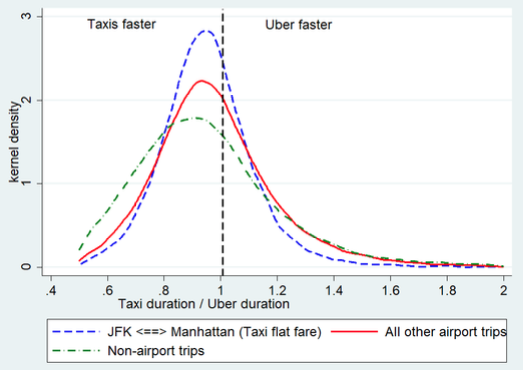 When not detouring, taxis on average travel faster and finish trips earlier than Uber drivers.3 This is consistent with differences in metered fare schedule for taxis compared to Uber. The taxi metered fare rewards distance travelled more than driving time compared to Uber's pricing schedule. Do drivers self-select? This is not mainly driven by drivers self-selecting into more profitable routes. Controlling for Uber or taxi driver fixed effects, we observe no significant change in estimation results. Driver selection can also take place on the extensive margin (taxi and Uber may employ different distributions of driver type). We were able to identify 1,892 former taxi drivers who switched to Uber. We find that these drivers detoured significantly when they were taxi drivers, but they no longer detour after joining Uber. This is strong evidence that drivers change behaviour under Uber's arrangement. Do taxi drivers detour to avoid tolls? The opposite is the case – taxi drivers have a higher tendency to take toll roads than Uber drivers. Do Uber drivers have a better route information? The difference in GPS adoption does not account in our data for the routing inefficiency of taxi drivers. We highlight the importance of incentive devices and pricing schemes as the underlying mechanisms for the observed difference between taxis and Uber. As such, our findings have implications for regulators and industry participants. For the taxi regulatory agencies, our results provide support for the development and implementation of smartphone applications that handle taxi dispatching and matching with passengers, digital payment, and passenger monitoring. These would significantly reduce moral hazard. It is notable that these innovations were introduced by a new entrant, although they could, in principle, have been developed by the incumbent taxi industry long ago. Also, it is important for the taxi regulatory agencies to re-evaluate the current pricing scheme that rewards taxi cab speeding, as well as the impacts of alternative pricing structures. For digital platforms such as Uber, our findings suggest an opportunity for techniques using machine learning to detect when drivers are behaving opportunistically, which may further enhance market transparency and trust building. There is growing body of research on digital disruption and, in particular, the potential for digital platforms to mitigate moral hazard. We identify sizable efficiency gains due to reduced agency problems. Our study provides models for, and documents the relationship between, technology and incentive design. It creates a challenge and opportunity for new contractual relationships on digital platforms. Athey, S, J Castillo, and D Knoepfle (2018), "Service quality in the gig economy", working paper. Cramer, J and A B Krueger (2016), "Disruptive change in the taxi business: The case of Uber", American Economic Review 106(5): 177–82. Goldfarb, A and C Tucker (2017), Digital economics, technical report, National Bureau of Economic Research. Hall, J, C Kendrick, and C Nosko (2015), "The effects of Uber’s surge pricing: A case study", The University of Chicago Booth School of Business. Lam, C T and M Liu (2017), "More than taxis with an app: How ride-hailing platforms promote market efficiency", working paper. McAfee, A and E Brynjolfsson (2017), Machine | Platform | Crowd: Harnessing the Digital Revolution, Norton. Tabarrok, A and T Cowen (2015), The end of asymmetric information, Cato Unbound. The rationale for such a stringent matching is that trips start or end at different locations may have a different optimal route, and trips that start and end at the same locations at different times are not subject to the same real-time traffic. The conclusions are not affected when we use other time windows, such as five or ten minutes. In fact, it is the driver's best interest to complete as many short trips as possible in thick markets to take advantage of the fixed-fare component of the driver's earnings. Although passengers may prefer faster travel, driving faster than the ongoing road traffic creates safety issues. Also, weaving in and out of lanes contributes to traffic congestion. Therefore, a full welfare account should include detours, time preference, safety, and externality (e.g. Athey et al. 2018).